The humble French fry too often plays second fiddle on the dinner plate. Some other foodstuff is given top billing while the fries are left to linger after the "and." Burger and fries. Milkshake and fries. Poutine? Gravy, cheese, and fries. But that all changes on Friday, July 13, because it's National French Fry Day. It's time for those fried starch sticks to take center stage. Many restaurants -- McDonald's, Wendy's, Dunkin' Donuts, among others -- are offering free or cheap fries to help you celebrate the day in the traditional manner, which involves a pile of napkins, a salt shaker hat, a roll of Tums, and a massive pile of fries. Oh, and probably some ketchup. Here are all the places you can go to indulge today after you get your Friday the 13th tattoo. The deal: With a minimum $1 purchase, you'll get a free medium order of french fries. The deal: The Wendy's mobile app has a new offer that will get you a free order of Baconator fries with any purchase. 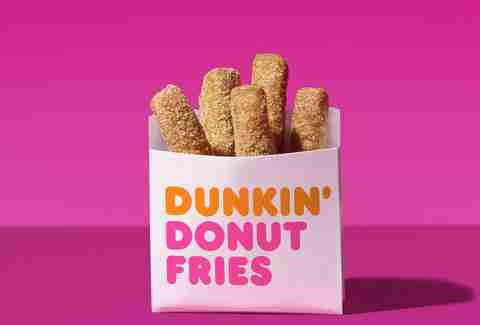 The deal: 25 Dunkin' locations are giving out a free order of Donut Fries to the first 100 people through the door at 25 of its restaurants. Here's the list of participating locations. The deal: You can pick up a free pack of classic Ore Ida crinkle fries. Head over here for details and to claim your bag. The deal: Get bottomless fries with the purchase of a burger or sandwich. It's the perfect deal for anyone attempting to see how many fries they're capable of eating in a single sitting. The deal: Pick yourself up a free order of hand-cut fries with the purchase of absolutely anything. Just be sure you mention the deal at the counter when you're placing your order. The deal: You'll get handed a free order of fries if you download the Mooyah Rewards App. The deal: The fast-casual hub in California and Nevada is doling out a free side of fries with every order of a farm-fresh burger. It's available at every Farmer Boys location. The deal: All seven California locations are giving out a free side of fries with a purchase of any bowl, wrap, pita, or salad entrée. The deal: Kids eat free all weekend at Steak 'N Shake. For every $9 you drop, one kid gets a free meal and each meal is served with fries or applesauce. The deal: You get a free order of fries with any purchase at this chain's 15 locations on the East Coast. The deal: Sign up for Checkers emails and you'll get a coupon for a free order of fries when you buy something. The deal: Sign up for the email newsletter and you'll get a coupon for a free small fry and drink with the purchase of any $6 burger. The deal: This BBQ chain with more than 100 locations across the country has a deal for 50-cent crinkle-cut fries all day long. The deal: It's just $2 for an order of bottomless fries at every Meatheads restaurant. The deal: Your neighborhood bar and grill is bringing back its all-you-can-eat Riblets & Chicken Tenders promotion. The $12.99 plate comes with bottomless fries as well. The deal: The delivery service is celebrating the day o' fries by offering $5 off any order over $20 that includes fries when you use the code "FRYDAY," per Offers.com. The deal: Take $1 off a milkshake and fries at the Culver and Pasadena stores. The deal: It has nothing to do with fries, but you can get free delivery on Chipotle orders across the US this week. The deal: This coupon will get you $1 off an order of Loaded Fries. The deal: After a long wait, Nacho Fries have returned as of Thursday, July 12. When: Around for a limited time. 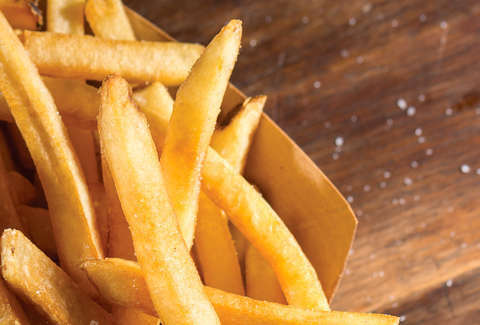 If you know of National French Fry Day freebies and deals we missed, email the details to us at news@thrillist.com and we'll add 'em here.